Here I am gluing on a peghead overlay. 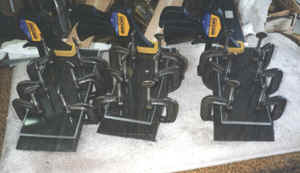 The only necessity for doing jobs like this in batches is having lots of clamps. 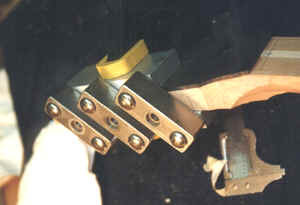 These small C clamps are also used for gluing linings in place. So I have lots. 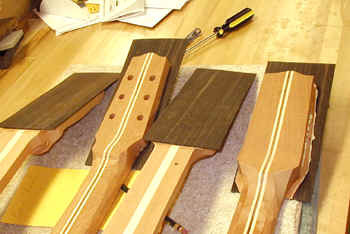 Several necks with the peghead veneer glued in place. Here the overlay has been rough trimmed with a bandsaw. 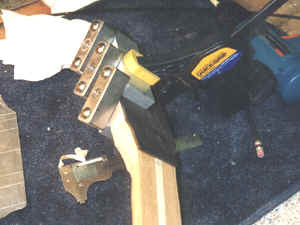 I then final trim with a flush cut router bit, and, if needed, cut binding ledges with the same cutters I use for the body. Most of my guitars have a bound peghead - typically a white black white purfling and tortoise binding to match the body. 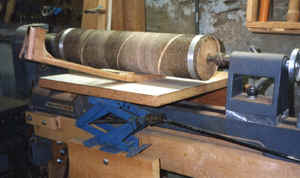 I thickness sand the peghead on a drum sander I built on one of my lathes. Simple but very effective. A closer view of thickness sanding. 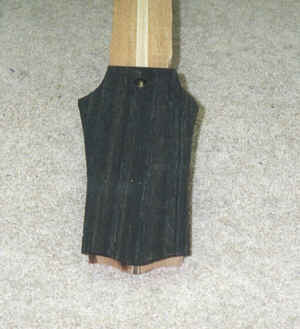 The curve near the fingerboard becomes part of the decorative volute I use on all my guitars. For slotted head necks I must start by drilling the peg holes. I use a jig I purchased from Stewart MacDonald Mfg. for the purpose. 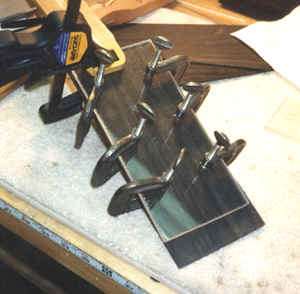 A closer view of this jig.